LOS ANGELES – People with paraplegia due to spinal cord injury may eventually get a chance to suit up, walk out the door and feel the ground beneath their feet, thanks to a five-year, $8 million Cyber-Physical Systems Frontier grant from the National Science Foundation. Awarded to three Southern California institutions — the Keck School of Medicine of the University of Southern California (USC), University of California, Irvine (UCI) and Caltech — the grant will fund the development of a fully implantable brain-machine interface device that aims to restore the ability to walk and restore lower extremity sensation. The brain-machine device will transmit commands to a robotic exoskeleton for walking that will, in turn, transmit sensory information back to the brain. "The restoration of walking is a very significant goal for patients after spinal cord injury," says Charles Liu, MD, PhD, principal investigator at the Keck School and professor of clinical neurological surgery and neurology and director of the USC Neurorestoration Center. "New solutions are possible with the recent advances in neuroprosthetics and regenerative medicine. We're at the point where we can create solutions similar in concept to Tony Stark's Iron Man suit, which is neurally integrated with him. Tony Stark's brain interacts with the suit, and the suit interacts with his brain. Everything the suit feels, his brain feels. That's the idea." The project will draw on the combined expertise of all the collaborating investigators. The first phase of the project will be to decode the signals generated by the brain that tell the legs to walk. Patients with epilepsy who have had electrodes implanted in the brain by Liu as part of their workup for surgical treatment of epilepsy will have brain signals recorded while they are walking. These signals will be decoded to control a wearable robotic exoskeleton by Zoran Nenadic, DSc, professor of biomedical engineering, and An Do, MD, assistant professor of neurology, from UCI. Richard Andersen, PhD, professor of neuroscience at Caltech, will work on methods of generating artificial sensation from the robotic exoskeleton by applying stimulation to the brain using implanted electrodes, allowing patients to "feel" while they walk. Payam Heydari, PhD, the project's lead principal investigator and professor of electrical engineering and computer science at UCI, will develop miniaturized electronics to make these processes fully implantable in patients. In the later phases of the project, these concepts will be tested in spinal cord injury patients. "We want to create a paradigm shift for what's possible for patients who are paralyzed by finding engineering solutions to medical problems," Liu says. The ambitious project is the culmination of longstanding and ongoing collaborations between Liu and his colleagues at UCI and Caltech through the USC Neurorestoration Center. "With this grant, Dr. Liu and his counterparts at UCI and Caltech are poised to push the frontiers of medicine and engineering into unchartered territory," says Rohit Varma, MD, MPH, dean of the Keck School. "It is this spirit of innovation that drives our clinician-scientists to find novel ways to prevent, treat or cure the most challenging health issues." 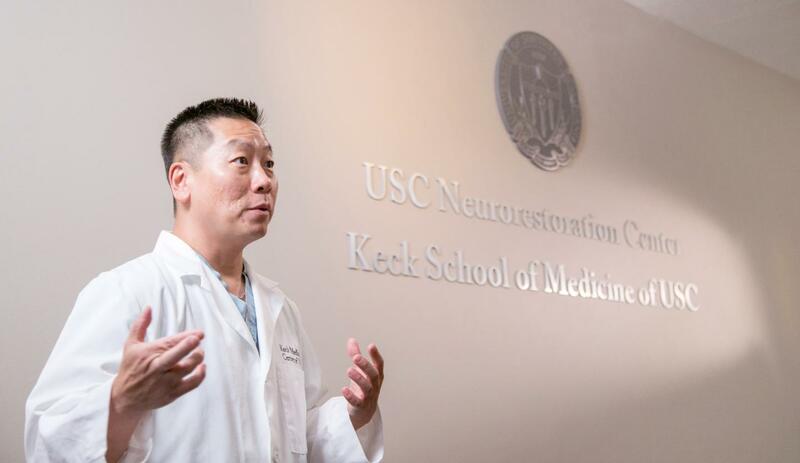 The USC Neurorestoration Center is focused on developing new strategies for restoring neurological function for patients with neurological disabilities. This includes repair through regenerative medicine; replacing lost function with neuroprosthetics; and optimizing the function of the nervous system after injury. The National Science Foundation's Cyber-Physical Systems program provides funding for projects that integrate electronic, computing and information technologies to address critical problems. Founded in 1885, the Keck School of Medicine of USC is among the nation's leaders in innovative patient care, scientific discovery, education and community service. It is part of Keck Medicine of USC, the University of Southern California's medical enterprise, one of only two university-owned academic medical centers in the Los Angeles area. This includes Keck Medical Center of USC, composed of Keck Hospital of USC and USC Norris Cancer Hospital. The two world-class, USC-owned hospitals are staffed by more than 500 physicians who are faculty at the Keck School. The school has approximately 1,650 full-time faculty members and voluntary faculty of more than 2,400 physicians. These faculty direct the education of approximately 800 medical students and 1,000 students pursuing graduate and postgraduate degrees. The school trains more than 900 resident physicians in more than 50 specialty or subspecialty programs and is the largest educator of physicians practicing in Southern California. Together, the school's faculty and residents serve more than 1.5 million patients each year at Keck Hospital of USC and USC Norris Cancer Hospital, as well as USC-affiliated hospitals, Children's Hospital Los Angeles and Los Angeles County + USC Medical Center. Keck School faculty also conduct research and teach at several research centers and institutes, including the USC Norris Comprehensive Cancer Center, Zilkha Neurogenetic Institute, Eli and Edythe Broad Center for Stem Cell Research and Regenerative Medicine at USC, USC Cardiovascular Thoracic Institute, USC Roski Eye Institute and USC Institute of Urology.